Well, in this case, it seems the 1st & 2nd are true, the reason being Kalpataru is a known brand and market sources say the plans are in place. There should be 4 towers coming up in this development supposedly the tallest towers in the vicinity. A project if planned well could well compete with Blue Ridge & Kolte Patil in Wakad. Before I delve into the product attributes of the Project Crescendo, let me tell you I hold high regard for Kalpataru as a developer but I have not been impressed with their delivery in the past in Pune. I've always had my reservations about their approach towards new markets especially Pune. The introduction of Jade did bring in some joy to the company as we have seen a shift and noted that Kalpataru is ready to offer apartments which are at par with their Mumbai counterparts. Kalpataru is is one company, barring Kolte Patil, of course, that has understood the Indian consumer market extremely well and if there's even a slight bit of space in between segments, trust Kalpataru to go aggressive and try to fill the gap with some or the other product. That's exactly what it has done with the Crescendo here. The company sensed an opportunity in the tower living segment and, after observing the competition for a while, decided to make its move - interestingly, quite a bit sooner than Kolte Patil to try and take a chunk of the volumes while it can. Once Kolte Patil arrives with its new offering in Wakad, it'll be a straight dogfight between Kalpataru & Kolte. Now, we didn't really get an awful lot of time to analyse the product, very little information disclosed. 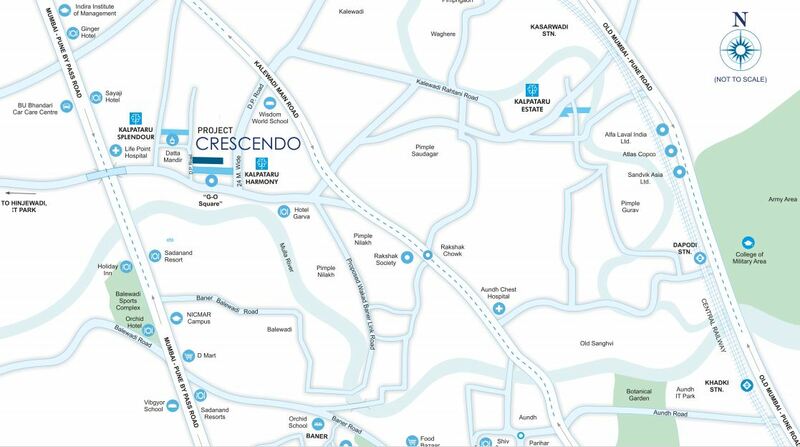 What we know is that Crescendo located next to Harmony in Wakad is a project that would appeal to the mid-income IT segment in Hinjewadi & Wakad. A product planning expert explained it well - "If, say, my father were to invest in a 2BHK home, he'd ideally go for the Splendour/ Harmony while a young and rising corporate executive would go for something like the Crescendo." Anyway, coming to the product itself. Starting at 80 lac onwards Crescendo is differentiated from its 'regular' sibling Harmony by a lot. This is tower living, better amenities, better features, more space. The product comes with digital locks, AC in apartments and modular kitchen which is a cool thing. Add to that the clubhouse it should be better than Harmony & Splendour as per plans which are great. Kalpataru has managed to make the Crescendo look is elegant and graceful but the lack of open spaces is a dampener. Also, we need to get a concrete idea on the delivery schedule before passing our final verdict. I had recently booked a flat at Kalpataru's new Tower. I loved their design and their sales team was very helpful and pleasant. I even made the initial payments and then came time for making the agreement. They said that I would have no issues and their agreement was "RERA Compliant". I went through the agreement which they shared and that's when I realized, that they were in fact, 'RERA compliant'- But only where it suited them! All the clauses in RERA that are there to protect the Promoter (i.e. the builder) were added and most of the clauses that protect an allotee's (i.e. a buyer's) right were simply excluded. If an allottee (Buyer) defaults on the payment of a single EMI they need to pay interest as the SBI maximum ROI + 2 percent. This is as per RERA and they've added it in their agreement. Now, on the other hand if they delay in giving possession you have 2 options - 1. Either you shutup and accept they new date. 2. Or you cancel your flat. No problem it's all good. You'll only end up losing your GST, stamp duty and other charges. If you've come through a broker (or channel parnter) as they are eloquently put, they will cut that brokerage which will be 2 to 3 %, even though you are cancelling because of their delay and they will cancel whatever they feel they need to. RERA says - "The Promoter shall give possession of the Apartment to the Allottee on or before __ day of __ 20_. If the Promoter fails or neglects to give possession of the Apartment to the Allottee on account of reasons beyond his control and of his agents by the aforesaid date then the Promoter shall be liable on demand to refund to the Allottee the amounts already received by him in respect of the Apartment with interest at the same rate as may mentioned in the clause 4.1 herein above from the date the Promoter received the sum till the date the amounts and interest thereon is repaid." They've also added an Indemnity clause which means you are effectively signing away your rights to hold them responsible for any mishap that you face in the premises. They refused to make these changes in the agreement when I discussed these points with them. They replied that it's a take it or leave it deal and they never make any changes for anyone. Ultimately I had to cancel the booking.